For the following tycho tutorials I expect you to have set up a global build project. Now we are going to build a feature, which is really easy with tycho. Source code for this tutorial is available on github as a single zip archive, as a Team Project Set or you can browse the files online. 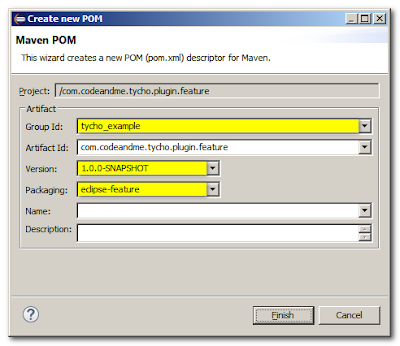 The feature com.codeandme.tycho.plugin.feature already includes our plug-in com.codeandme.tycho.plugin. The only thing to do is convert the feature project to a maven project. Do this using the context menu Configure/Convert to Maven Project. I guess you are familiar with the procedure right now. Make sure you set Packaging to eclipse-feature. Now open the pom file of your releng project (com.codeandme.tycho.releng/pom.xml) and add our feature project as a new module. Don't forget to check Update POM parent section in selected projects. As before you will see an error marker on your feature project. To get rid of it switch to the Problems View, locate the error and use the quick fix feature to solve it. Run your build to verify your settings. Features are used to cluster bundles to convenient units. P2 will show features to your users, it will not show bundles which can be selected for install. You might want to keep your code in multiple bundles (eg UI/non UI) but still they serve the same topic (like Java programming). Then features are used to put it all together. Thanks for a great tutorial.I have tried to create a sample plugins and added them to a feature.this feature is added to product.all these are linked to parent pom.when i tried to build it I am getting below error. though I have added this plugin to the contents of product. The pom you trigger should refer to all required plugin and feature poms so that all dependencies are built. Possibly you are unning just the product pom?